Alternatively, click the Pay Bills icon located on the Home page. You see the Pay Bills window. Change the Payment Date (at the bottom) to the date that you want to appear on the checks. By default, this field shows today’s date. If you want another date on the payment check — for example, if you’re postdating the check — change this date. Set a cutoff date for showing bills. In the Show Bills Due On or Before date field, tell QuickBooks which bills to show by entering a date. If you want to see all the bills, select the Show All Bills option button. Use the Sort By drop-down list to tell QuickBooks how to sort the bills. You can arrange bills by due date with the oldest bills listed first, arrange them alphabetically by vendor, or arrange them from largest to smallest. Identify which bills to pay. If you want to pay all the bills in the dialog box, click the Select All Bills button. If you want to clear all the bills you marked, click the Clear Selections button. If you want to pick and choose, click to the left of the bill’s due date to pay the bill. Note that after you apply a payment, the Clear Selections button replaces the Select All Bills button. Change the Amt. to Pay figure if you want to pay only part of a bill. That’s right — you can pay only part of a bill by changing the number in the Amt. to Pay column. Get the early payment discount rate on your bills, if any. You may be eligible for an early payment discount on some bills. To find out how much of a discount you get, click the Amt. to Pay field and then click the Set Discount button to see the Discount tab of the Discount and Credits dialog box. Use the Discount tab’s Amount of Discount box to give the dollar amount of the discount. Use the Discount tab’s Discount Account box to specify which account should be used for recording the money saved through the discount. Get a list of credit memos that you can apply to the payment. Click the Set Credits button to see the Credits tab of the Discount and Credits dialog box. If you want to use one of the credits listed to reduce the amount of the bill, click it and then click Done. Select a payment date, method, and bank account. If you’ve subscribed to and set up the QuickBooks online bill payment feature, you have another payment method choice: online payment. If you plan to print the check, select the To Be Printed option button. Many businesses use QuickBooks to keep track of checks, but instead of printing the checks, they have employees write them by hand. If your business uses this method, select the Assign Check Number option button. 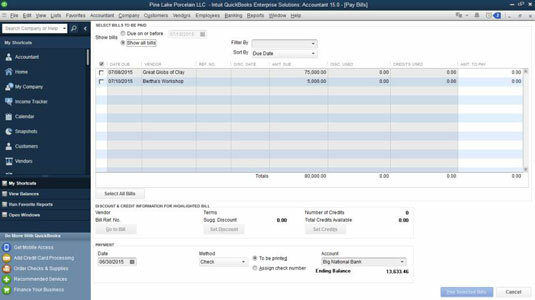 Then, when QuickBooks asks how it should number the check, either give the number by typing it into the appropriate box or tell QuickBooks to automatically number the check. Click the Pay Selected Bills button to pay the bills. 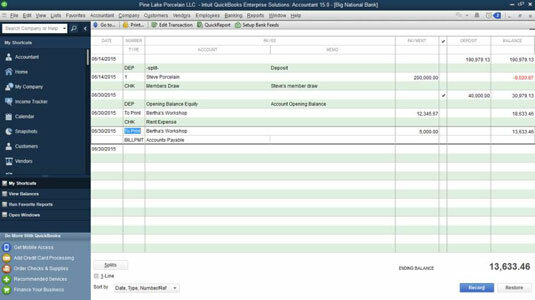 QuickBooks displays a Payment Summary dialog box that lists the bills you’ve paid and tallies the payments. You can click the Payment Summary’s Pay More Bills button to return to the Pay Bills window and select other bills for payment. Or you can click the Payment Summary’s Print Checks button to take the next bill payment step: printing checks to pay the bills. If you do click Print Checks, QuickBooks steps you through the process for printing checks. One other little bit of accounting trivia. When you do pay a bill, QuickBooks goes into the Accounts Payable register and notes that you paid these bills; then it goes into the register and “writes” the check or checks. Here, you see a $1,000 bill from Bertha’s Workshop being paid. QuickBooks shows the original bill amount as the amount that’s paid, not the original bill amount minus the early-payment discount. It needs to use this method to completely pay off the bill. In the Accounts Payable register, you see BILLPMT in the Type column and the amount paid in the Paid column. The Due Date and Billed columns are now empty. In the bank account register, you again see BILLPMT in the Type column. But don’t kid yourself — these bills aren’t really paid yet. Sure, they’re paid in the mind of QuickBooks, but the mind of QuickBooks extends only as far as the metal (or trendy plastic) box that holds your computer. You still have to write or print the checks and deliver them to the payees. If you’re going to write the checks by hand, enter the check numbers from your own checkbook into the QuickBooks register Number column. You want these numbers to jibe, not jive. And another thing: If you enter a bill, you absolutely must use the Pay Bills command to record the payment that pays off the bill. If you don’t do this, the unpaid bill just sits there forever, lonely and forlorn.